We came to Crimplesham towards the end of a long day which had started with heavy showers, but which was now brightening up into a fine spring evening, the lowering sun picking out the gingerbread carstone speckles among St Mary's more familiar flint. The tower appears bigger than it is, with the big, checkerboard buttresses standing out all the more thanks to the rendering. At first sight, this is an overwhelmingly late medieval building; and, indeed, there was a major restoration in the 1870s, when the chancel was rebuilt. But stepping into the 17th Century porch takes you back in time almost a thousand years, because the south door is a massive Norman structure, the tympanum sadly lost to us. A Norman lancet hides on the north side, but the interior of the building is almost completely Victorian in character. Not much here seems to have happened since the 1870s, although the one major medieval survival, a 15th Century roodscreen, was installed in the tower archway in 1969. 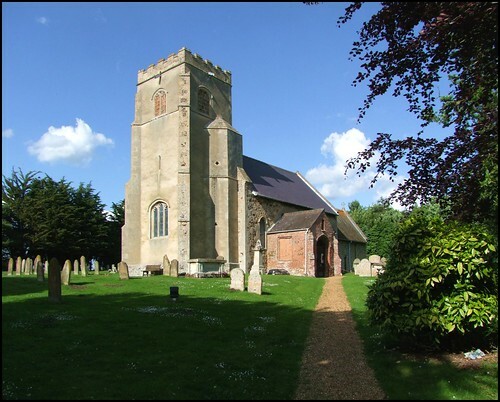 It came from a redundant church in Essex, and looks most un-East Anglian, a reminder of the cultural and artistic fracture along the Stour Valley which lasted until well into early modern times. Crimplesham comes into the benefice with Downham Market, a heartily Anglo-catholic parish, and some of that influence is felt here, with devotional statues and pictures. It is all very simple, a church furnished in a seemly manner. The only jarring note is the organ, which dominates the small chancel, and partly cuts off the view of the sanctuary from the nave. But otherwise, it is a peaceful and uplifting interior, obviously well-loved and cared for. I liked this church a lot, and so it is with a slightly heavy heart that I must tell you that we were treated with some suspicion when we went for the key. I must hasten to add that this was not so much the fault of the keyholder, who was a charming old boy who I chatted to for quite some time when I took the key back, but the fault of the instructions he had obviously been given. He asked me to give him something that identified me, as a deposit for the key. I suppose he would have accepted anything really, but I gave him my credit card, thinking to make the point here that it was most unfair on him for the the Parish to ask him to do this. It would be extremely embarrassing for the parish of Crimplesham if any allegations of card-cloning or identitity-theft were laid at its door. I have no reason whatsoever to think that this might happen, but I think that if I was an influential member of the Crimplesham PCC I would be be rushing to ensure that the keyholder stops asking for identity details and deposits as quickly as possible. It is worth saying that keyholders, and suspicious ones in particular, are no defence against theft and vandalism. Indeed, keyholders statistically make theft and vandalism more common, because ordinary pilgrims and strangers will be less likely to visit the church, and the best defence against theft and vandalism is a well-visited church. I doubt that single-minded thieves would be put off by being asked for ID or deposit. I dare say they are fully prepared for that kind of eventuality. Be that as it may, we chatted for a while about the war memorial, and in particular the two Wade brothers who are remembered on a separate plaque. Fred and Frank Wade were Privates in the 7th Batallion of the Norfolk Regiment. They joined up together at the start of the War, and were killed within three weeks of each other in the early winter of 1915 during the assault on Loos, in the Pas de Calais. The Battle of Loos was the first time that poison gas was used, incidentally by the British on the Germans, but it seems likely that the Wade boys were both blown to pieces, because neither of their bodies were ever found or identified. They are remembered together among 20,000 names of the missing on the Loos memorial. The plaque at Crimplesham says that it was erected by the parishioners. What dark days the news of October and November 1915 must have brought to this small, pretty village.